I stood on the ice today and chopped a test hole to review the freezing history. The temps were in the high 30s. The one and a half inch black ice sheet was shooting cracks from under my feet. Ice was layered, showing 5-6 freeze and thaw cycles. Not ice for responsible recreation yet. However, ............... in about 2-3 days this stuff will be nice skating and sailing. Do not venture onto new ice this season without picks and a line reel. Picks can be purchased from Jamie at Nordic Skater and perhaps he will even have a few line reels for Spectra safety line as well. Hmmmmm we'll see. Otherwise stay tuned for a limited supply of reels at Kitewing. Its time to order parts to replace worn bits and pieces. I recommend finding some adhesive backed insignia cloth or sail repair tape to patch up your sail. Even torn mylar can be patched with insignia tape. Order new tip extensions if you need them. Check the inside of your tip extensions, the flat side just beyond the plastic part which inserts into the front tube. If the tip extension shows signs of compression failure its time for a spare tip. Check battens. You can order new ones if the battens you have are kinked and bent from too many bad falls. Check the Y tubes if you are sailing an older wing with an aluminum Y bracket, the Y tubes may be egged out so badly they need to be replaced or reversed to ensure that the snap pin in the Y bracket safely engages the tube. Folks flying older frames might consider ordering a new style boom and Y tube assembly to convert an old frame. The new style frames are easier to assemble since the front tubes are not fastened to the Y tubes. How many of you have cursed the Y tube which refuses to behave while you try to stuff it into your sails? Kitewing has changed. There is a new web site. I have been told that there is a North American warehouse so that new wings may be purchased on line and shipped direct to North American customers. Prices have been significantly reduced. I believe parts support may also be much better. Check out the new site at Kitewing.com and see for yourself. 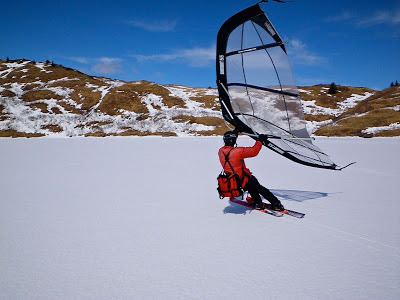 As far as it goes I would like to read any comments from folks regarding Kitewing. You can post the ones that glow in the dark with positive praise on this forum. Otherwise send the negative ones directly to Kitewing via the contact form on the new web site. The new web site is still a baby trying to stand on its feet so be gentle. I changed the pick on the home page to show the latest chunk of black ice chopped from my own early season sailing spot here in Kodiak. I am hoping some of you will be inspired to take checking the ice this season seriously. Its sort of a science. Any how, by looking at the chopped block of ice its possible to gauge the quality of the ice. Looking at trapped air bubbles and layers caused by freezing and thawing tells me a lot about how the ice formed and how strong it is. Its a no brainer: If you cant stand there and chop a hole the ice is kinda sketchy. If its cracking under your weight: get off. Leave your chopped block vertical so the next guy can see it and use the info. We have the dates, we have the site! Please check out on wissa2013.fi on further details.